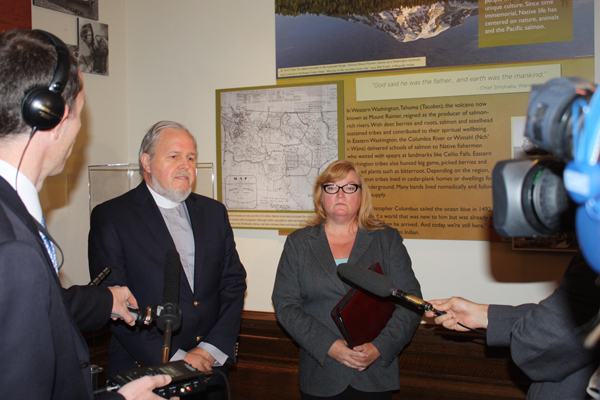 Paul Benz and Cheryl Stumbo talk to the media after filing their initiative to the Legislature. Continuing the debate that began in the Legislature after the Newtown shootings, gun-control advocates have filed an initiative to the Legislature to require universal background checks on gun purchases. The measure was filed with the Secretary of State on Tuesday by Faith Action Network, including Cheryl Stumbo, who was gravely wounded by a gunman at the Seattle Jewish Center, and Paul Benz, a longtime church leader and social justice advocate at the Capitol. Backers will have the rest of the year to gather about 325,000 signatures of registered Washington voters. If validated, the measure would go first to the 2014 Legislature, which could approve it as submitted, ignore or reject it and allow it to go to the fall 2014 ballot, or write a legislative alternative that would accompany the initiative to the ballot. The measure largely reflects legislation proposed by Rep. Jamie Pedersen, D-Seattle, and others during the session. Gov. Jay Inslee has strongly supported the legislation, but it failed to clear even the Democratic-controlled House. Campaign strategist Christian Sinderman said the issue has become a frontburner issue in the state and nationally, with polls showing heavy public support, in the 80 percent range. The campaign is coordinating with a variety of gun-safety groups and expects both sides in the debate to draw national support and contributions. “This issue is gaining traction,” Stumbo told reporters gathered at the Capitol. The Legislature may actually approve the measure as public pressure mounts, she said. If not, the voters will do the job, she said. The proposal has been resisted by the National Rifle Association and other 2nd Amendment groups.